Thinking Pinoy: Duterte’s Drug War: Where's the Logic in 400 Deaths? Duterte’s Drug War: Where's the Logic in 400 Deaths? 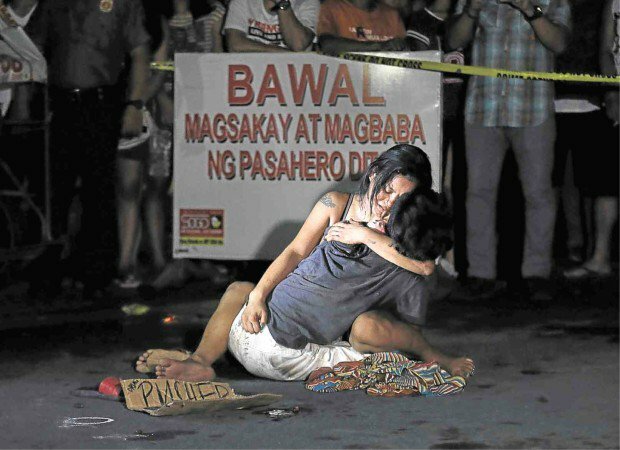 Philippines, a killing field? Here’s for the 0.2% [Star], before they foam at the mouth. In barely a month, Philippine President Rodrigo Duterte’s war on drugs has resulted into staggering and unprecedented 420 alleged narcotics-related killings since June 30 [Inq]. Most, if not all, of these killings are blamed upon Duterte. After all, it was he who started the fight, right? "Shoot him and I'll give you a medal," Duterte said, according to its the wire service, the [Washington Post] reported. ThinkingPinoy (TP) admits, Duterte’s words don’t help him a lot in his public relations campaign. What caught TP’s eye, however, is the phrase “according to its wire service”. That Washington Post article was based upon a news wire from the Associated Press (AP) Philippines. In this article, TP will examine the facts surrounding these 420 deaths and put them under the microscope. Just for 15 minutes of fame? The first question is: "Is 'Shoot him and I'll give you a medal' the only thing he said at that time? The answer, as usual, is "No," so what exactly did Duterte say? Duterte’s speeches in all his campaign rallies follow essentially the same outline, so it’s safe to say that he said pretty much the same thing throughout the campaign season. Duterte basically encouraged the public to (1) seek help from the police, or (2) carry out a citizen’s arrest, or (3) kill the criminal if criminal is armed and hostile to a point where the citizen’s life is in grave danger. Quick Question: Is this even legal? Under the Rules of Court, Rule 113, Section 5 [LawPhil], a warrantless arrest, also known as "citizen’s arrest," is lawful… when an offense has just been committed, and (a citizen) has probable cause to believe, based on personal knowledge of facts or circumstances, that the person to be arrested has committed it. So there’s legal basis for Citizen’s Arrests. Duterte’s words were not an outright order for a regular citizen to magically turn from a person who minds his own business into a Rambo-Terminator love child. If that were the case, then “human criminal rights” advocates should also advocate for additional funding for mental health institutions. Because the idea of regular citizens throwing away a relatively quiet existence to turn into a vigilante, just for a medal, just for 15 minutes of fame, is just crazy. A controversial statement that’s more open to interpretation attracts greater internet traffic, and greater internet traffic means more revenue. Money talks. It is a source of conflicts of interests among journalists [TP: Dear Karen Davila]. This would’ve been a classic case of incompetence, if not for the fact that Davila admitted four years later that she bought Philex Stocks at that time, stocks that could have already been in her possession prior to the interview. Why would Davila open a hydrocarbon-rich can of worms when it’ll hurt her investments? But it’s not just about money, it may also be about cognitive bias [TP: Duterte’s P Guevarra]. Take for example Rappler’s article “Rodrigo Duterte’s 386 P. Guevarra Property”, where Rappler subtly insinuated, based on their inside source, that Duterte’s skillful exploitation of legal loopholes allowed him to hide ill-gotten wealth – the San Juan Property in this case – from public scrutiny. After a bit of sleuthing, ThinkingPinoy found out that the controversial property was bought using Duterte ex-wife Elizabeth Zimmerman’s funds. With the annulment of their marriage, their assets have become separate and unrelated. But Rappler decided to publish the story without so much as an SMS inquiry to the Duterte camp. Rappler will never admit to incompetence, so it can only be attributed to cognitive bias. If Duterte gave a convincing alibi, such as the one stated above, the article would’ve been less interesting or worse, less of a fit to the Rappler’s prejudices. ThinkingPinoy concedes, hence the following sections. Duterte killed them and that’s it? ThinkingPinoy admits that the first suspects on these drug-related killings will be the Philippine National Police (PNP), and it has been mentioned and quasi-analyzed countless of times by tens – if not hundreds – of news outlets. The problem, however, is that most of these news outlets have forgotten a basic logical concept: the process of elimination. The “Process of Elimination” is a method to identify an entity of interest among several ones by excluding all other entities. For example, suppose a Phenomenon X can be caused by Reasons A, B, C and D and nothing else. Reason A causes Phenomenon X if and only if Reasons B, C, and D have been invalidated. Are there any other plausible explanations? After all, it’s the question that Philippine’s Big Media companies seemingly deliberately fail to ask. #KumaKarenDavilaBa. Before he assumed office, Duterte said some policemen may be killing their accomplices in drug trafficking to ensure they will not be implicated in the criminal activities [Star]. The administration is now investigating suspected policemen, with the tip-off point being Duterte’s shocking speech where he publicly accused five police generals of having links to the illegal drug trade [CNN]. Narcopolitics is alive and well in the Philippines, with incidents reported in as far back as 2001 [Star]. Former Interior Sec. Joey Lina even acknowledged this in 2002 [Star]. Since that admission, it is incumbent upon the government to do something about it, but it simply ignored the issue. In May 2010, authorities were planning to investigate Liberal Party (LP) National Treasurer and Quezon Governor Rafael Nantes after the discovery of a drug transshipment and manufacturing base on Icolong Island in the province [Balita]. Nantes died in a chopper crash a week later. LP bet Noynoy Aquino won the 2010 Presidential Elections, and nothing was heard about Icolong Island eversince. ThinkingPinoy did a google search for “Icolong Island” news articles published after Aquino’s inauguration on 30 June 2010. There were none [Google]. Fifteen years after Lina's admission, the government anti-drug agency PDEA admitted in February 2016 that "they have no data to gauge how serious is the threat (sic) of Narcopolitics in the country. [MT]"
An LP-led administration with "uninvestigated" drug links made sure it stayed that way. Duterte won the presidency with the suppression of drug trafficking as one of his campaign’s pillars. His decades-long track record also shows his “hate for drugs”. In short, this is a president who’s hell-bent on neutralizing the drug menace. If I were a public officer who’s into drugs, I might as well cover my tracks before that Mindanawon sits in Malacañang. And by “cover”, TP means “kill his underlings”. The Duterte Administration has already pointed out this angle yet it seems that Philippine media men conveniently ignored it. SIDE NOTE: Under the previous administration led by Pres. Aquino, the New Bilibid Prison turned into a shabu (meth) laboratory, as the present administration investigates alleged “Shabu Tunnels” where inmates cook meth for sale and distribution outside the facility [Inq]. Now, imagine what would happen, or has happened, after the PNP burned on July 15th 180 kg of shabu (meth), worth Php 1.77 billion [MT]. Many Bilibid VIPs wouldn’t be very happy with their sales agents. Did Philippine media explore this possibility? No, so far. It's too complicated for them, perhaps. Illegal drugs is a lucrative industry and “early adopters”, such as the first several of the nine Chinese drug cartels [Star], have benefitted the most as they operated with negligible competition. The problem? When competitors want a slice of the pie. Bloody inter-cartel violence rooted on territorial disputes is not new. Let’s see how the the Sinaloa Cartel works [DailyMail]. Hinosa was a “sicario”, a desperate individual who became ruthless killers for the narcotrafficking industry and in his case, for the Sinaloa Cartel. Sicarios were an integral part of the mass murders ensuing from the Sinaloa Cartel’s declaration war on the Juarez Cartel in 2007, where more than 20,000 people in Ciudad Juarez, Mexico lost their lives in the next five years. Yes, 20,000 people were killed in a span of just five years because of the war between the Sinaloa and Juarez Cartels. Since 2006, over 100,000 people have died in Mexico because of the inter-cartel wars [WaPo]. 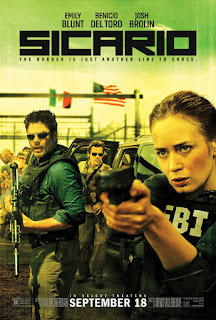 The Mexican cartel wars were so bad, they deserved a movie with an A-List actors Emily Blunt, Benicio del Toro, and Josh Brolin in the cast [IMDB]. And who happens to also operate in the Philippines? The Sinaloa Drug Cartel. A dead drug pusher lies on a pool of blood, wrapped in duct tape (masking tape), and with a conspicuously placed sign showing “I’m a drug pusher” or something to that effect [Inq]. April 2014: Two (2) in North Cotabato [Preda], another (1) in Quezon City [PP]. ThinkingPinoy believes 35 corpses [T.Y. Sass] should suffice for Big Media's witch hunters, but in case they want more, there’s [THIS], [THIS], [THIS], [THIS], [THIS], [THIS], and [THIS]. Masking tape executions happened frequently in the past, and all within the Aquino administration. That is, the problem of wrapped-and-labeled executions, instead of a Duterte invention, is something Duterte inherited from Aquino. The question, however, is who did it? Masking tape executions are a trademark of the Mexican Drug Cartels. Mexicans call these masking tape executions as “Encintado”, a term referring to a dead body found suffocated in packing tape [Kirchner 2014]. The hooded men brutally beat the woman and wrote on her clothing: “I am an extortionist at La Linea’s service”. 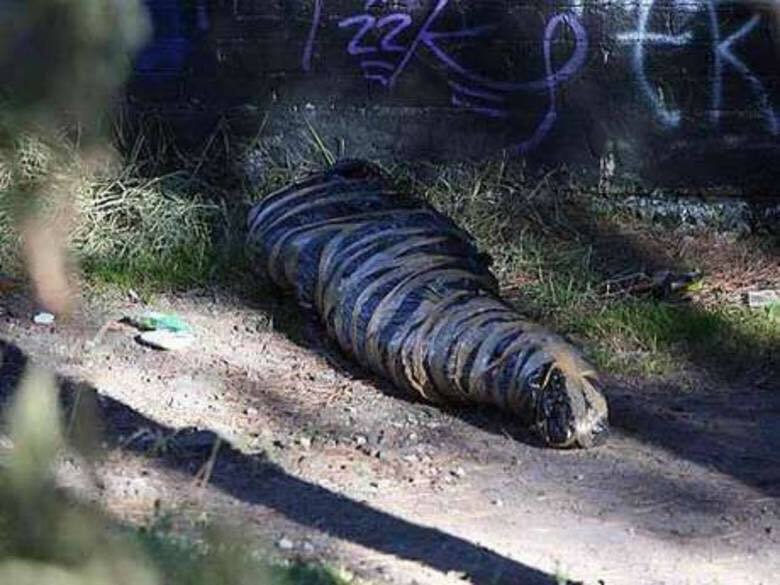 The woman was found dead…her head encintado (suffocated in packing tape) and riddled with bullets. This will happen to all extortionists, carnappers, rapists, snitches, rival drug dealers. Respectfully, the New Sierra Cartel. And who operates in the Philippines? The Mexican Sinaloa Drug Cartel. Is it possible that the Sinaloa Drug Cartel, which hails from Mexico, is simply applying its “Best Practices” when it expanded operations to the Philippines? Learning more about Mexican cartels is too much work, so let’s just blame it on the government, right? Simply blaming Duterte is easier. It requires a lot less thinking. Has Big Media shown that Reasons B, C, and D are invalid? So why did Big Media choose Reason A? TP would've employed the "process of elimination" on these four, but this article is running long. Dear Big Media, respect is neither demanded nor bought, it is earned. And at the rate you're going, this is bad news.